If we told you once throughout 2017, we told you a number of times that the smart speaker was having a great year. We also told you to expect the product to appear under many a Christmas Tree during the holiday shopping season. Now, a new survey from National Public Radio (NPR) and Edison Research reveals that 16% of American adults own a smart speaker and that is up a whopping 128% from last January. Sure enough, 7% received the device as a holiday gift, and 4% found their first smart speaker when they ripped the wrapping paper off their holiday present. 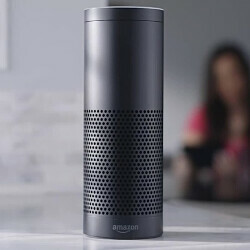 A rather simple device that combines a speaker and a virtual assistant, Amazon created the category with the 2015 launch of the Amazon Echo. For the assistant, Amazon created Alexa and she had an amazing year. Now, companies like Google and Microsoft are currently competing with Amazon. Other tech giants like Samsung and Apple will have a smart speaker released in 2018. The product has connected with consumers as 65% with a smart speaker say that they wouldn't want to go back to life without it. Currently, Amazon owns 11% of the U.S. smart speaker market compared to the 4% owned by second place Google with its line of Home smart speakers. The pair are doing brisk business with the device as 39% say that they use the product in place of listening to AM/FM radio. 34% say that at times it replaces their smartphone, and 30% use their smart speaker in place of watching television. For a product not even three years old, the device has really caught on with Americans. One of the best reasons to own the device is to turn on/off smart lights and to take control of smart thermostats and other smart appliances around the home. The survey found that 31% used their smart speaker to control household devices during the week before the survey was taken. And 38% of smart speaker owners want to buy a second unit to control more smart home products in other rooms. It sounds like the smart speaker has a bright future ahead in the U.S., at least for the next few years. The survey consisted of questions answered by 1,010 U.S. adults over the phone, and 806 U.S. adults online.